This article first appeared in Enterprise, The Edge Malaysia Weekly, on October 9, 2017 - October 15, 2017. Industry 4.0 is happening whether people are ready for it or not, and as more jobs are lost to automation, it will be up to companies, and finally, the individuals themselves, to ensure that they remain relevant in this brave new world. 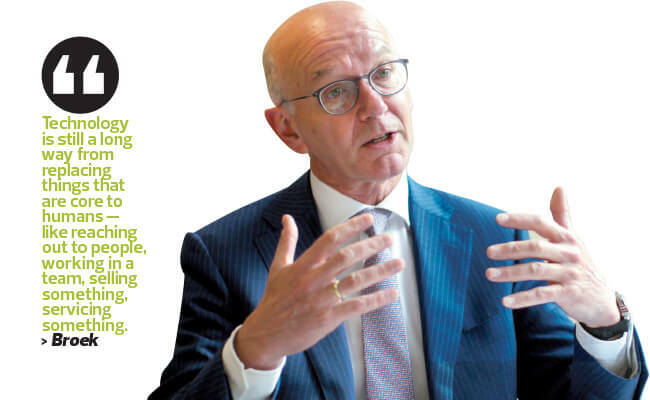 Dutch multinational human resource (HR) consulting firm Randstad Holding NV CEO Jacques van den Broek says the purpose of HR departments are shifting and many of the traditional tasks, such as recruitment, are being outsourced to firms such as Randstad so they can turn their attention to the more profound challenge of keeping everybody in the company fit for the future. Randstad works with its clients on the mid to long-term scenarios but van den Broek says the company also advocates that employees take care of their own continued employability rather than leave it up to their employers. It has launched a big data-based product called Employability Scan, which is aimed at those who are 45 and above and want to remain active and relevant. “You fill in all sorts of data on yourself such as how you are trained, what you are doing in your job every day, your expectations of the future, where you want to work and what you want to earn. “And then we offset these answers with a peer group and it gives you a vision or a diagnosis of your employability. Clients buy this from us. They fill in the questionnaire and get an interview with one of our career counsellors,” he says. Following the scan, they have something to present to their boss in terms of their own particular training needs. Alternatively, a company could do the scan for a large group of employees to discover what kind of training it needs to do on a larger scale. Randstad has been doing outplacement for more than 20 years. “What happens is when people lose their jobs, we sit them in front of a screen and we say to them, go find a job that you like. Not unnaturally, they look for a job similar to the one they had just lost. But that job, or type of job, might have disappeared. “So we then try to rewire them. We discuss what they are good at and what they like doing and then we might try to get them to take a totally different route. Because, as I said, some jobs are disappearing,” he says. Randstad launched its Tech&Touch strategy a couple of years ago using the Randstad Innovation Fund to learn about and source HR technological solutions and couple it with the human touch to drive its business forward. Van den Broek reiterates the need for a proactive approach. “You have to prepare yourself and not just sit there and wait for it. You can go to a company like ours and sit down with us and have a proactive look at the labour market and your possibilities in the labour market. You will find that you actually have a lot of options. “I think many times you need to mentally rewire yourself or get dedicated training. But it is better to do this when you are still in a job. Because if you lose your job and don’t get back into the labour market within six months to a year, it gets tougher because you lose your self-confidence, your network and a bit of your discipline,” he points out. 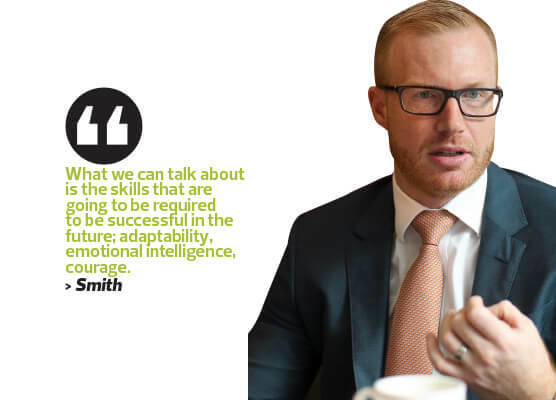 Randstad Singapore, Hong Kong and Malaysia managing director Michael Smith cuts in: “We can’t sit here and say what our kids will be doing in the future. What we can talk about is the skills that are going to be required to be successful in the future; adaptability, emotional intelligence, courage. In short, the jobs of the future are not the jobs of the present. Candidates are going to have to think on their feet and be flexible enough to turn on a dime and constantly reinvent themselves. And they must use their human attributes to ensure they continue to remain relevant.